Daughter of the Daghda and the Morrigan the Goddess Brigid was born on the 1st day of February which became her sacred day of Imbolg. She was born with flames around her forehead just as the sun came over the horizon. Now the Morrigan not being the most nurturing of goddesses, the infant Brigid was suckled by another worldly cow, white, with red ears and grew up in the other world tending to an apple orchard whose bees moved between this world and the other world. Brigid loved learning, knowledge and inspiration and she set up a school of sorts in Kildare where she tended to a sacred grove. Her followers were instructed for ten years and she taught them how to gather healing herbs and tend to livestock, how to forge iron into tools. They would spend thirty years in service to her, the first ten years in learning, the second ten years in tending to her sacred grove and working and the final ten years in teaching. There was an ancient oak tree in her grove in Kildare as well as a healing well and a sacred flame. Nineteen of her followers, all women, tended this flame. Each one had to watch over it for a day not letting it go out and on the 20th day, Brigid herself would tend to this everlasting flame. She was said to reward any offering to her so people started the custom of throwing coins into wells to honour her. She lit the fire of inspiration in the hearts of poets and musicians and is said to have been married to Senchán Torpéist, the author of the Tain Bo Cuainge. One day two lepers came to her for healing and she told them to bathe each other in her sacred well until their sores were gone. The first leper bathed his companion faithfully and the sores fell away from his skin until he was completely healed. But when the healed man looked at his fellow, he felt such revulsion that he could not bring himself to touch the other even to bathe him. When Brigid found out that he hadn’t held up his end of the bargain, she was furious and she struck him down with leprosy again. She then wrapped the other leper in her mantle and his disease was gone from him in an instant. She was said to have consorted with Breas, the handsome young king whose misrule lead to the second battle of Moytura. They had a son together called Ruadhan who grew up to be a great warrior and fought with his father’s Formorians against his mother’s people in the battle. Ruadhan tried to kill his uncle, Gobniu, the Smyth, but the craftsman struck a blow against Ruadhan who died instead. When her son fell, Brigid made the first keening over his body, the sound was so loud and so sorrowful that it took the battle fury out of all that were still fighting and they lay down their arms at the sound of it. 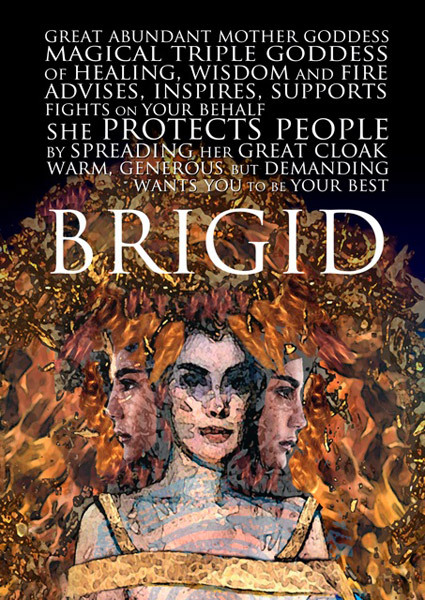 Brigid was worshipped as the Goddess of Leinster and invoked by Leinster men when they went into Battle. She was especially invoked by midwives, being associated with women, healing and childbirth. Her healing cloak could expand in size as needed and she could spread it all over Ireland in times of need. She was said to spread her cloak over Ireland at her festival day of Imbolg on the 1st February to usher in the change of seasons and turn winter into spring. Solar crosses with four arms equal in length were woven on Imbolg to honour Brigid’s role in changing the four seasons and were kept in people’s houses to invoke the goddess’s protection. The first dew of the morning fell from her cloak on that day and any rag left out to catch it would be infused with Brigid’s healing and could be laid on a sick person for the curing of sore throats and other ailments.